Have you ever spent a day immersed in a book? Or if you're a stay at home mom, one of those days where you squeeze the reading of a book into every crack inbetween everything else you do that day? Monday was one of those days for me. I sat on the couch reading when my kids had a snack & watched a movie. I coloured and cut things out with kids and when they didn't need my help, I sat with them reading a few pages. I emptied the dishwasher & started dinner, then I read while it cooked. I may have ignored some laundry and I didn't do any blogging. And when Ken got home, he was shocked to see that my bookmark had moved from the front of the book that morning, to the end of the book. It's one of those books you just can't put down once you get into it! I really enjoyed it. I love books that are sentimental, that romanticize the beauty of nature, and dwell on the joy within the little moments in life. Anne of Green Gables is one of my favourites and it was Miss Montgomery that introduced me to the idea of the kindred spirit, so when I opened Edenbrooke & read the words: "To kindred spirits everywhere", I just knew I was going to like this book. I wasn't disappointed. I found Edenbrooke to be fast paced (it may be a romance, but there's some action and adventure in there, too! ), sentimental, and romantic, left with no loose ends. 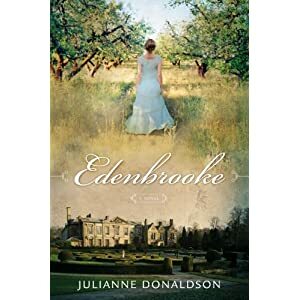 Edenbrooke will be released on March 27th. You can find more information about the book on Deseret Book's website. It's available as a paperback, an MP3 Download, or an audio book on CD. How do you feel about this kind of "Good Book Day"? Do you allow yourself a day like this every now & then? What's the last book that you couldn't put down?